In this unique holiday gift guide, I organized my most popular holiday shopping articles into five different categories. You’ll find a gift list with creative, unique holiday gift ideas for everyone on your list – whether you’re shopping for writers, grandparents, or animal lovers. I’m kicking off this gift list with something I featured on my Gifts for Insomniacs article, on my sleep blog. The SleepPhones – Wireless Sleep Headphones are a great holiday gift idea whether or not your gift recipient sleeps well. They’re super comfortable, and allow people to drift off to sleep while listening to music or podcasts. SleepPhones contain an ultra-thin, padded, and removable internal stereo headphone system, which is Bluetooth-enabled. When you’re doing your holiday shopping, the most important thing to remember is who you’re buying gifts for. That’s why I organized this gift guide into categories of different types of personalities, lifestyles, ages, occupations, and relationships — which I list below. I took holiday gift ideas from each of my most popular blog posts, and linked to the post so you can dig deeper into those gift ideas. First, though, I want to tell you that one of my most meaningful gift articles is 17 Gift Ideas for After Mastectomy Surgery. If you’re looking for holiday gift ideas for a woman battling breast cancer, that article should be your first stop! I based each gift idea on instructions for healing from a surgical oncologist, so the gifts aren’t “just” gifts. They’re actually tools to help her heal. Does it seem odd to have “divorce gifts” on my holiday gift guide? There’s a method to my madness: Christmas is often the hardest time of year for people going through a divorce, separation, breakup, or loss due to death. Finding the right holiday gift ideas for people who are heartbroken takes extra care. If your gift list includes someone who is grieving a loss, read 10 Gift Ideas for Friends After a Break Up. If you’re looking for holiday gift ideas for a specific type of person, please let me know in the comments section below! I’d love to research and create a holiday gift list for you. Each of these categories only includes a few holiday gift ideas – but lots of links to other, more specific, articles. Watches aren’t necessarily on everyone’s gift list, but they are awesome gift ideas. Some people collect watches, and most people like to have a watch for sports, a watch for dressy occasions, a watch for daily wear, etc. Watches for men or women are one of those “can’t lose” holiday gift ideas. Whether you live with your partner or far away, a Jar of Messages in Mini Envelopes – Missing You is a thoughtful way to stay connected. This is a creative DIY (do it yourself) holiday gift idea. It’s simple, even for people who aren’t “crafty”: Get a pretty glass jar, ribbon, and paper to write thoughtful, loving notes. As you can see from the image, the messages in the jar come in mini envelopes, which is a very classy touch. Whether or not you buy this jar of “missing you” notes, it is a lovely gift for couples in a long distance relationship. If you’re in love with someone who lives far away – or you’re holiday shopping for someone in a long distance relationship – read 10 Best Gifts for Couples in Long Distance Relationships. A Wi-Fi Cloud Digital Photo Frame With iPhone & Android App is a thoughtful holiday gift idea because you can load it from afar. That is, you can take a photo with your smart phone and immediately send it to your parents, grandparents, or partner at work. The digital photo frame is in both categories: gifts for couples and gifts for parents and in-laws I bought both my husband and my in-laws a digital frame a couple years ago – before they were instantly update-able. They’re better now. Some of my favorite holiday gift ideas are in 10 Gift Ideas for Your Boyfriend’s Parents, on Quips and Tips for Love and Relationships. 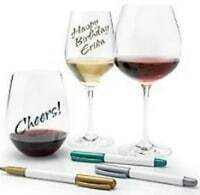 One of my favorite gift ideas – which I’m getting for my husband’s parents this Christmas – are the Wine Glass Writer Metallic Pens. The pens aren’t just for wine glasses – you can write your name or a message on highball glasses, beer steins, or even coffee mugs. This is a fun holiday gift idea – especially if you include a Vacu Vin Vacuum Wine Saver. No holiday gift guide is complete without a bestselling wine product or encouragement to buy a nice bottle of wine! These are practical and classy additions to your holiday shopping list. Most of my previous articles about holiday gift ideas for animal lovers were about dogs because I have two dogs and spend lots of time researching gifts for them! So this part of my gift list is for cat and wildlife lovers. If your gift list includes a dog lover, read 10 Christmas Gift Ideas for Dogs and Dog Owners. If you haven’t heard of Grumpy Cat, you need to Google him. The Gund Grumpy Cat Plush Stuffed Animal Toy is a super cute gift for animal lovers, even if they’ve never heard of Grumpy Cat. Gifts for cat lovers (grumpy or otherwise) also include t-shirts, books, calendars, and coffee mugs. The cool thing about Grumpy Cat gifts is that they’re not only for Grumpy Cat fans. I’ve never visited the Grumpy Cat website or Facebook page, but I love the plush Grumpy Cat stuffy. Gund makes great gifts for animal lovers – especially when you listen to Calvin and Hobbes’ take on the world: “You know, sometimes the world seems like a pretty mean place. That’s why animals are so soft and huggy.” ― Bill Watterson. A different take on the “tails” from a veterinarian gift idea for animal lovers is 50 Years of Wildlife Photographer of the Year: How Wildlife Photography Became Art by the Natural History Museum, edited by Rosamund Kidman Cox. It features many of the greatest nature photographs of all time and includes an incredible variety of styles, skills and approaches to wildlife photography. This gift idea for animal lovers has just been published, and offers a whole new perspective on wildlife and photography. If you’re looking for holiday gift ideas for your sister, read Sister Gift Ideas. Are you shopping for someone who is recently divorced – and perhaps still grieving or angry about the break up? You’ll find several holiday gift ideas in 8 Divorce Gift Ideas That Are Thoughtful and Different. A Carnevale Sterling Silver Blue and White Swarovski Elements Snowflake Pendant Necklace. It’s one of the most thoughtful holiday gift ideas because it’ll remind her of the holidays, but she can wear it any time of the year. It’s a gentle and compassionate holiday gift that will remind her of the beauty of the season. I also love this snowflake pendant because it’s perfect for a grandmother, grand-daughter, wife, mother, teacher – any woman on your gift list. I don’t wear jewelry, but this is one of those gift ideas that is classy, inexpensive, and thoughtful. Women with a dark sense of humor might have this on their holiday gift list: The Ex Kitchen Knife Set by Raffaele Iannello. It’s a knife holder designed not only to hold knives, but to remind people going through a divorce that they’re not alone. The Apollo Precision Tools 135-Piece Household Pink Tool Kit isn’t just for women going through a divorce – it’s one of those holiday gift ideas all single women could use. The idea behind your own tool kit is that she is independent and strong enough to wield a screwdriver, hammer, and a wrench. If she doesn’t know how to use a tool kit, this holiday gift idea will help her become more competent and confident. Dimensions Needlecrafts Paintworks Paint By Number, Adirondack Evening includes high-quality acrylic paints and a fine paintbrush. I don’t have time to take painting lessons, but I’ve always wanted to paint my own picture. If you’re holiday shopping for someone who wishes they had more time for art, then a paint by numbers kit for adults would be ideal. The tricky part of this type of holiday gift is that it’s very dependent on your recipient’s personality and tastes. For instance, I actually wouldn’t like the Adriondack Paint by Number picture as much as the Venice one – but I included the Adirondack picture in this gift list because it’s more popular on Amazon. If you want to buy a creative, artistic gift but don’t know which to select, get an Amazon.com Gift Card . Make sure your recipient knows it’s for a specific type of holiday gift on her list, so she doesn’t get sidetracked and buy something more practical! Writer’s Digest , The Writer , and Writing Magazine are the most popular magazines for writers. If your writer already subscribes to a writing magazine, then you can simply extend the subscription. Or, subscribe to something different (The New Yorker, for instance) to take your writer out of her comfort zone. For more ideas for writers, read Creative Gifts for Writers, Authors, and Poets. One of the easiest – and most popular instruments to learn how to play is the guitar. In 6 Gift Ideas for Guitar Players, I share a variety of possible items on a guitar player’s gift list. I play the flute, and I recently splurged on an $800 Yamaha flute. It wasn’t easy to spend that much money on an instrument, and the last thing I want to do is spend more money on flute lessons. So, getting music lessons would be one of my most cherished holiday gift ideas. It’s something I need and that I don’t want to spend money on – which makes it one of the most perfect holiday gift ideas. What do you think of this holiday gift guide? If you have any gift tips or feedback, please share below!